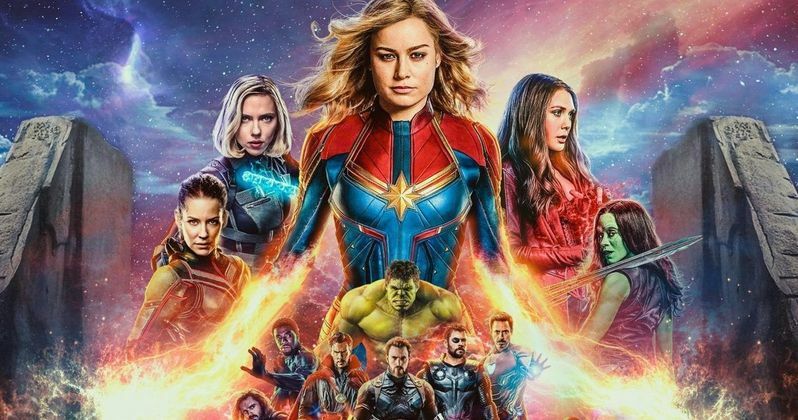 It has long been confirmed that Carol Danvers will be joining Marvel's biggest superheroes for the first time in Avengers: Endgame. But the how and why of how that all happens is being kept mostly a mystery until the movie hits theaters this April. Or is it? In a recent interview, Nick Fury himself, Samuel L. Jackson, seemingly gives away the big secret behind Carol Danvers' upcoming appearance in what will surely be the biggest movie of the year. There's a lot Endgame has to answer for following the events seen in Infinity War. Captain Marvel, which is just a month away from playing out on the big screen, will offer some clues, most regarding Carol Danvers and her super powers. We've long heard that she is the most powerful being in the galaxy. She may even best Thanos. Now, Samuel L. Jackson reveals how she will probably meet up with Captain America and his Decimation survivors as they attempt to rectify the damage done by Thanos and put him to sleep once and for all. "I guess we might figure out that she can do things that nobody else can do. She can time travel so maybe she can get ahead or behind or whatever, and figure out what all that is. The fact I have the pager 20 years later - it gets addressed in an interesting sort of way." Now it's sounding more like Captain Marvel is the key to all this time travel business, but that's not to say she doesn't use the Quantum Realm to achieve this. The time travel elements explain how Brie Larson is able to retain her youthful figure in modern day, since she'll be almost two decades older. Though, with a little CGI airbrushing, the 29 year old Larson could easily be made to look 53, and she probably wouldn't look all that different. Robert Downy Jr. is currently that exact same age, and his look from Home for the Holidays, released in 1995, isn't that drastic. The time travel element is expected to account for her 25 year absence, though that doesn't necessarily make sense. If she can time travel, why was there no reason for her to show up anywhere else in the timeline between 1995 and now? That will all presumably be addressed in both Captain Marvel and when she meets up with the original Avengers in Endgame. However this all shakes out, Time Travel is definitely a key component to the action that fans will see play out on screen this April. And who's to say it won't be used to bring in an unexpected cameo or two in Captain Marvel this March? This news comes from ComicBookMovie.com.